50 Years! That’s a long time to be in business and worthy of a celebration! 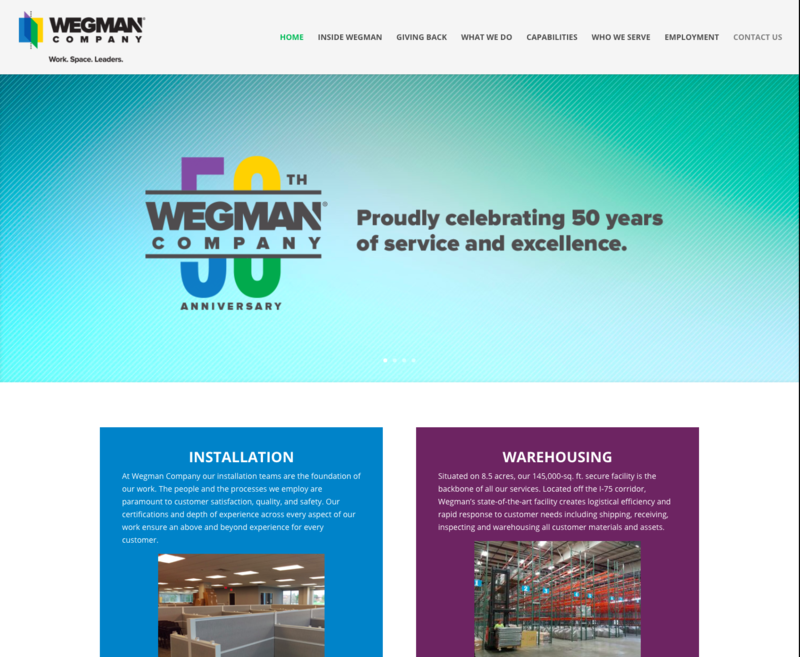 Sound Press was able to partner with Wegman Company in making that celebration begin by the honor of doing a redesign of their decades old brand. Wegman Company installs, relocates, and warehouses office furniture systems for major corporations in a large radius around Cincinnati Ohio. Brand design, brand messaging, new website, improved functionality, collateral, marketing automation, and campaigns. Great efforts to grow the company towards the next 50 years in business. Sound Press began by looking at the historical design of the brand mark, and what that brand mark has meant for many years. The complexity of dimension and meaning was certainly a story, but when company team members are not around to have conversation about the brand mark when it was seen, that opportunity was lost to tell that story. Previous efforts in redesign had fallen short. It was not easy capturing the life of the company, the multifaceted work Wegman Company does, and the story and legacy behind the great business that has been built. Thru rounds of design, stakeholder feedback, creative refinement, and committee decision making, Sound Press and Wegman Company came to a new brand mark that captures enough of a reflection of the past with a forecast towards the future with vibrancy of color, dimension, and a new tag line of Work. Space. Leaders. The brand is always the cornerstone of design, and this project was no different in that regard. Having established the brand and brand standards, Sound Press was able to pursue website development, signage, collateral assets, many other company brand representations. Executing a brand across multiple mediums and platforms takes some work in color management and management of the brand in general to ensure consistency. Website development and web functionality improvements were made to make sure the digital home base of the company had the right platform, content, and calls to action to ensure current and potential customers were being served information they were looking for. Content continues to be king in search engine optimization, so it was important for the company culture to realize a new state of being that would include multiple people contributing to content development. 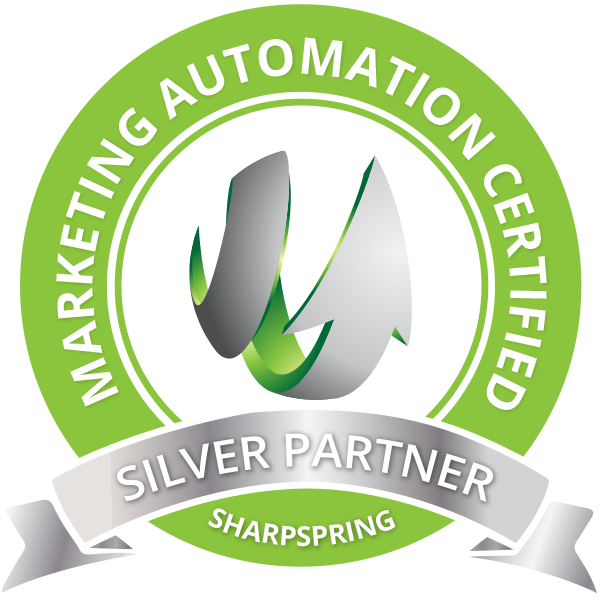 Marketing automation and email campaigns were put in place to be able to have a level of business intelligence never before seen by the company. 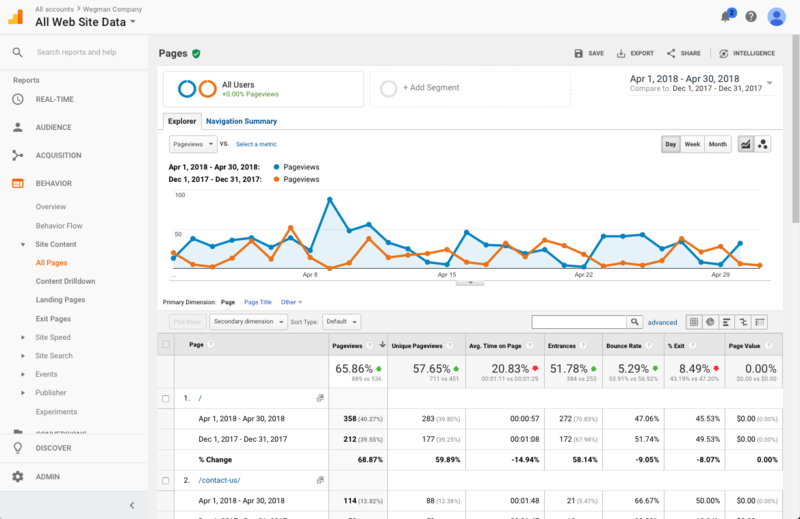 Have tracking metrics and analytics with campaigns and site visitors helps show how the company can make better business decisions based on data. Lead Generation forms bring real individuals into light for content desired and showing engagement. Business intelligence way beyond just sessions or visitors that Google Analytics shows, has proved extremely valuable for the sales team to get an idea of the fruitfulness of their efforts. Campaigns have provided metrics and foundations for not only content development, but refining sales strategies and targeting. All of these efforts and the data garnered behind them helps Wegman Company pursue a Continual Improvement culture for growth.